Through miniature painting, she plays with mediums from prints and drawings to videos to depict hierarchies of power, and colonialism. Eight artists interpret traditional motifs on a contemporary canvas. Ghungroos have stood the test of time. Since the Mughal courts resonated with the sound of ghungroos to Madhubala as Anarkali wearing them for Mughal-E-Azam -— their legacy has only continued. 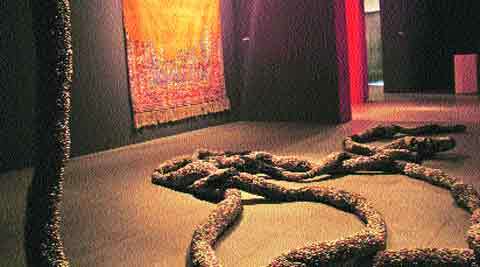 But when Vibha Galhotra turned the diagnosis of an infection in her intestine into an artwork, using ghungroos to recreate the shape of an intestine, she gave the word “traditional” a whole new meaning. Galhotra’s serpent-like installation titled Between…, which is spread across an entire room at Exhibit 320 gallery as part of the exhibition “Past Tradition”, is her attempt at turning a form of traditional craft into a new contemporary work. The black spots in the coiled installation seem indicative of the infection that once threatened her immune system. “This is a metaphorical work where I have stitched ghungroos together. Ghungroos, which are used for other purposes and are a strong part of our country’s past, have been given a modern interpretation on tradition,” says 36-year-old Galhotra. “Past Tradition” is an exhibition that explores how artists from the MENASA (Middle East, North Africa and South Asia) region use traditional techniques and motifs from their cultures in non-stereotypical ways, while pushing past the expectations and stereotypes associated with it. Mumbai-based curator Diana Campbell Betancourt says, “The eight participating artists use traditional techniques and motifs in their works, which communicate far more than what one would see if they were framed purely for the technique. New York-based Pakistani artist Shahzia Sikander’s work is a good starting point. Other participating artists include New York-based Iranian artist Kamrooz Aram, who combines simple Modernist geometric patterns with motifs from Persian carpets and Islamic decorative arts, while Nepalese painter Tsherin Sherpa, who specialises in thangka paintings, traces the journey of the protector deities from the thangka tradition from Nepal to his current life in California. Baku-based Faig Ahmed is a mixed-media artist based in Azerbaijan, who creates handmade carpets, a tradition of the East and a symbol of migration and imagination. His yellow carpet titled Flood of Weigh might make floor rugs in homes look boring.